Let cupid make his mark. 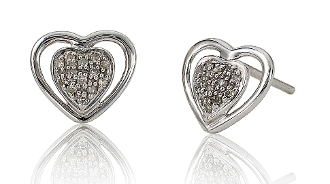 This romantic post style earring features a sparkling pave Diamond heart framed inside an open highly polished 14 Karat white gold heart outline. This eye-catching setting secures with butterfly clasps and features 0.10 Carat t.w. round Diamonds.